Amateur Radio operators around the Midlands might wonder what’s going on down at 145.225 FM most hours of the day and night. It’s the Wythall Christmas Contest. The rules are biased to encourage club members to work each other, every day over the Christmas break between Christmas Eve and New Year’s day. At the time of writing, late on Boxing day, over 50% of club members have been active and exchanged serial numbers with other club members. Serial numbers as high as 50 have been reported already. I’m very pleased to report that I have just completed my first QSO on the HF bands using JT65-HF, a mode that was designed for very weak signal EME work but is now in use across the HF bands. 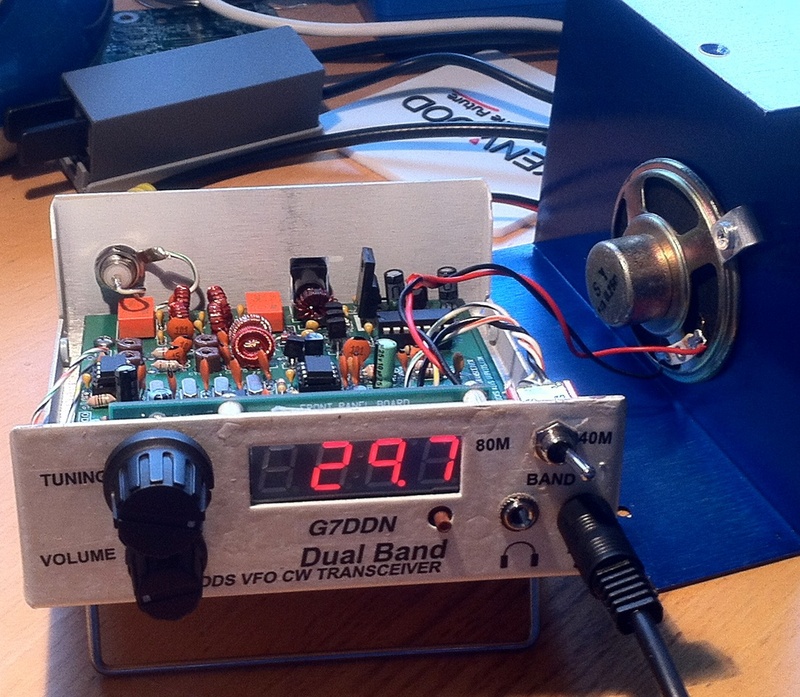 If you have an RF isolated sound card you can be in business inside 10 minutes. You don’t even need a COM port for PTT, it will work with VOX. I downloaded my version here here but I believe there are other decoders out there. In a nutshell, this is the most quirky and strange mode I have ever used but certainly fun. Calling CQ and answering CQ can only happen at the top of the minute. Each “over” takes 48 seconds and therefore you have 12 seconds to make up your mind what to do about the next over. On top of that, the protocol only allows for an exchange of 13 characters. However, it is highly tolerant of interference, fading and other nasties – ideal for EME as it seems (and also for bands that are apparently “closed”). There’s a fabulous paper written here which I recommend to all readers. Of interest, the character strings that are transmitted are not sent one at a time, like CW but as a scrunched up packet. Decoding these messages are a mathematician’s dream! Click the thumbnail for a full-sized screenshot of my first QSO – and let me know if you have a go. Wythall Radio Club will be running a Foundation course at their club shack at Wythall House, Silver Street, Wythall, B47 6LZ from Monday 23rd January between 8-10pm, and every Monday until the examination on Monday 5th March. Cost for this course is £40 which includes, the examination fee, course book, course notes and membership of the Wythall Radio Club until our next AGM in October 2012. For those students 18 or under, or unemployed and on benefits, we have a reduced fee of £32.50. Club member Chris G7DDN has been busy with his soldering iron already this winter, as the photo shows. This is his version of the Hendricks “Weber Dual Bander” kit. See www.qrpkits.com/dualbander.htm. Chris says, “This is a fantastic little kit, it came quite quickly from the US and attracted no extra duties or VAT. There were a couple of missing bits which were remedied by Doug at Hendricks Kits and despite the transformer windings being a little awkward to work out, a post to the Yahoo Group sorted it out quickly”. He says, “I’m achieving 5w out on 40m and 7w on 80m”. Delighted with himself, Chris continued, “It’s a sensitive receiver with a 600Hz crystal filter and I’ve finished it just in time for the Christmas holidays – and the G-QRP Club Winter Sports!”. Chris has promised a longer report on the build of this kit in the next Club Newsletter in the New Year. We are pleased to announce that all four of our candidates (pictured) who took the Advanced course and exam with us in December, passed and gained their coveted M0 callsigns. Well done to them. The Advanced course is not a walk in the park and requires a lot of work and effort to slog your way through the 15 sessions of theory and practise and then face a 2 hour, 62 question examination at the end of it. But it is achievable as our record at Wythall shows. It is almost 100% pass over the past 5 years. Our next course will be in September 2012. 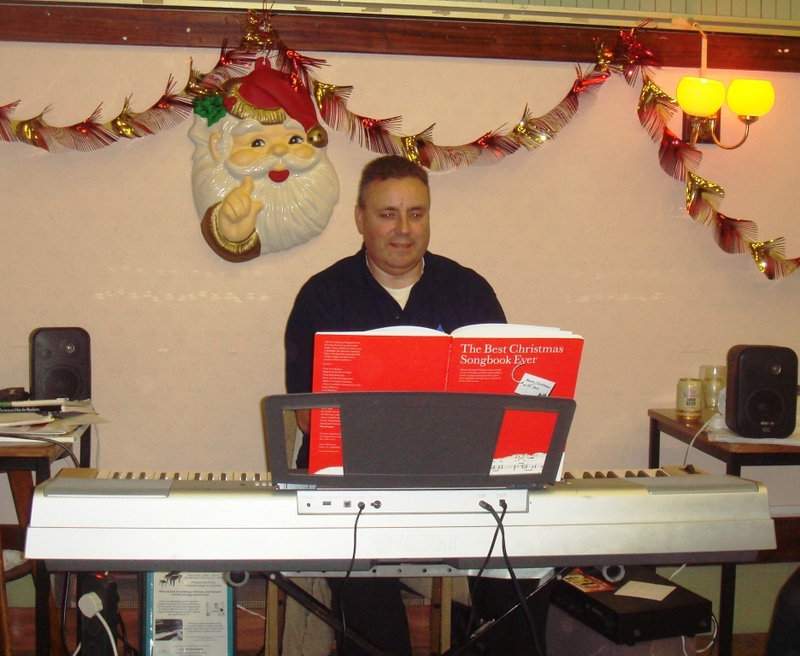 After a break last year, Wythall Radio Club held its Xmas Social at Wythall House on Friday December 9th. 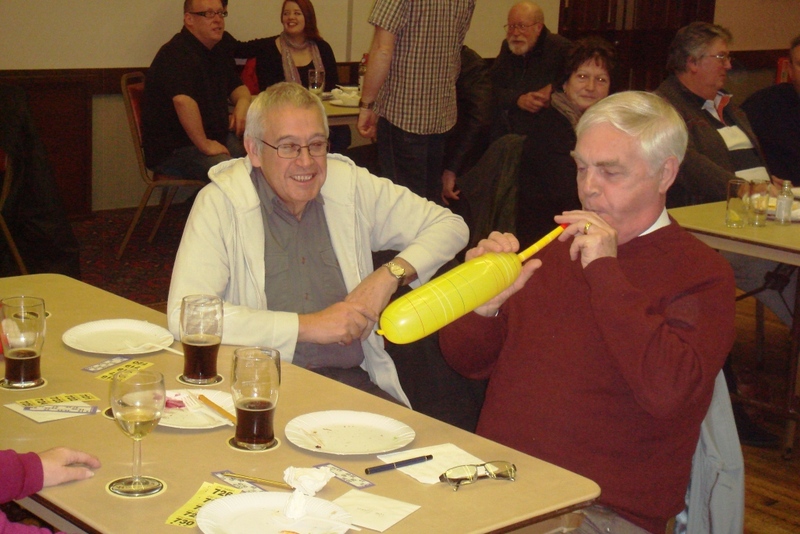 As in previous years this was a great success with about 35 members and their family enjoying an American Supper together with some live music from Chris G7DDN plus skittles organised by Colin G6ZDQ. The whole event was put together very professionally by Stu 2E0NYC who had the added pleasure of also having heard that day that he was now M0NYP. The evening saw a super raffle of prizes generously donated by members as well as the famous stand up bingo, won this time by Walter M0GRO. The skittle winners were Roger and Liz (friends of Colin G6ZDQ and Janett), after a play off between them and Peter G4LWF and Mo. 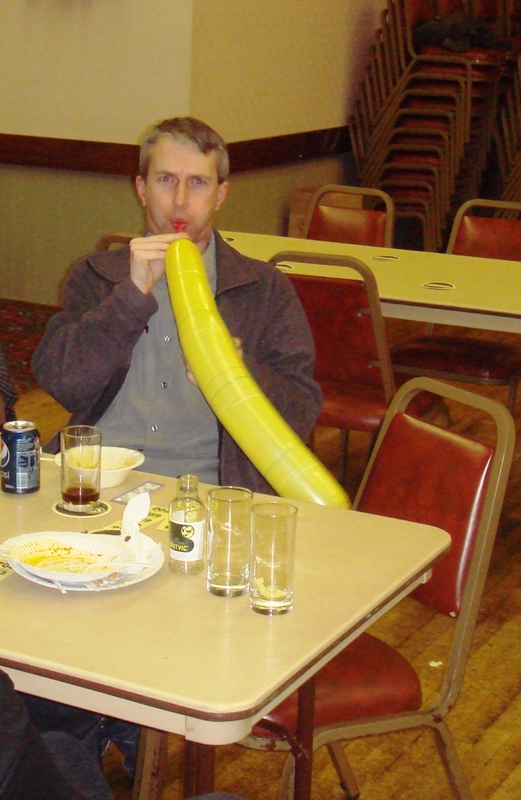 The food was of a very high standard with competing (or is that complementary) curries from Barry M0DGQ and Steve 2E0SDD. One final challenge was sliding a £1 coin towards a 1l bottle of whiskey, the one nearest being the winner, who was Roger. This morning, I was playing around with DM780, a package which is bundled with the Ham Radio Deluxe suite, when I stumbled across RU6YJ calling CQ on 15m. He was using MFSK-16 although it took me a while to work out what mode he was on. 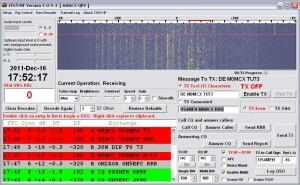 The trace looked like OLIVIA 250/8 or DominoEx16 but neither would decode his signal. 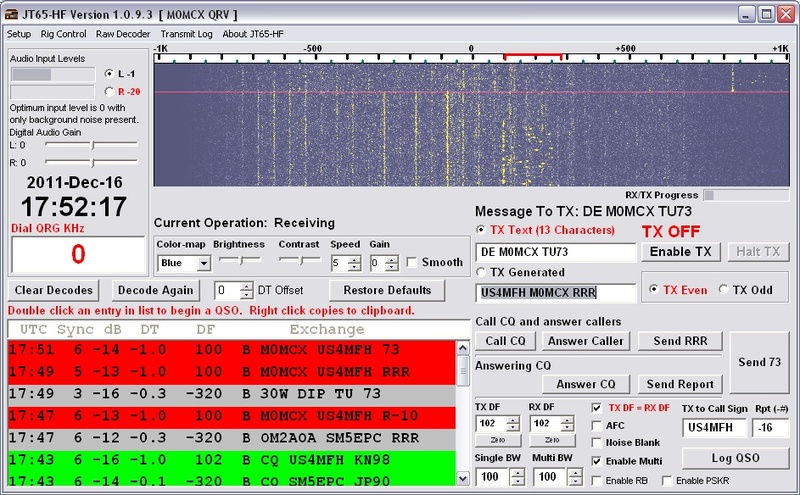 Eventually, I worked out that he was using MFSK-16 and I replied with my call. After the usual digital pleasantries, he asked me if I could send a picture. I was slightly taken aback because I had no idea that MFSK-16 could send pictures. I asked him to wait 10 minutes whilst I worked it all out. After some super-fast research, I discovered that a 200 x 200 picture in monochrome wouldn’t be too ostentatious and I managed to replace Simon Brown’s (author of HRD) default picture with my own and make a test send a few khz up from where Vlad was. In the meantime, he’d found another victim and was mid-QSO so when he called CQ again, we started down the path of exchanging photos. What made this quite funny is that I lost the macro to send the pic, so I manually entered “<send pic>” which didn’t work, he just received the words “<SEND PIC>”. In the end, we both managed to hit the right buttons. I sent mine and he sent his. Afterwards, he asked that I email him the received picture. We exchanged via email and I have attached them to this post. I was prompted to select an appropriate station to connect to and after some deliberation, I ended up listening to a blank frequency of apparently HB9QX-5 on my dial frequency 3.597.50, USB. Nothing but static. Eventually, I plucked up the courage to hit the START button and away she went! My PC clicked and the FT1000MP sprang into life and sent an automated burst of data via RF out across the 80m band. I was amazed when I heard HB9QX-5 responding and off the two stations went, dancing around bytes, handshaking, Rcv Frames, Error correction and more. I was astonished as my data finally left my station and literally before the two stations agreed to terminate their session (it is fully automatic), an email had arrived in my inbox! The Club is hosting the Advanced Examination tomorrow, Monday evening 5th December 2011. Four intermediate license holders; Paul 2E0CVU, Stu 2E0NYC, Mark 2E0RKX and Paul 2E0DBL are in the hot seat. Lead instructor Chris, G0EYO commented, “I know I speak for everyone in wishing them all the best of luck and hope to hear of their new M-Zero callsigns before Xmas”. 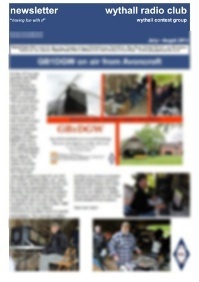 This edition covers the Bat Detector by Barry, M0DGQ, Lord Pettitt’s Shooting Party and an outline of Chris, G7DDN.